Hartlepool United are “not a million miles away” from being a “decent” side. So says boss Ronnie Moore, despite seeing his team slip to their seventh home defeat of the season, 2-0 to Exeter City. Pools had plenty of pressure and a collossal amount of ball – the post match stats even suggesting a 60-40 split in percentage possession. But while they “huffed and puffed” they could not break down the Exeter door. In fact, the first time the keeper had to put his back into a save was a long-range grasscutter by Jake Carroll – in the 83rd minute. With Exeter sealing the points just a minute later through Joel Grant’s close-range finish – via the crossbar – it was inevitable there would be some early departures from the stands and terraces and a few boos at the full-time whistle. Moore said he was frustrated too, but pointed to the fact that Pools had enough pressure to have won the game. “People might think we are crackers but we aren’t a million miles away,” said Moore, who takes Pools to Notts County this Saturday..
“We have some decent players – they just need to believe in themselves. “To be honest, I don’t think we were that bad. I know we lost 2-0, but it’s not like Exeter battered us. “There was nothing in it. “We’ve knocked on the door and were decent without being brilliant – I’m not kidding anyone, people have watched the game. “We didn’t deserve to lose the game, they didn’t deserve to win 2-0. “This was a winable game. We started well and we should have been 1-0 up in the first minute. “Woodsy has hit the lad on the line and then he’s had another chance when he’s tried to walk it in. “Had we scored in the first minute, a goal settles everyone down. “Trevor [Carson] has only had to make one first-half save which he has pushed around for a corner. “Second half we huffed and puffed, we had a lot of the ball, great balls come in from Nathan [Thomas] and he’s had two great chances himself. “One he’s tried to volley he should have had a touch, if he does that he scores. Moore thought Pools gave away two bad goals. Alex Nicholls headed the Grecians in front against the run of play nine minutes before half-time, when he got the better of Scott Harrison. “They scored from a cross when our centre-half is sleeping and has allowed a free header,” said Moore. “He was marking space, but space has never scored a goal, it’s the player you need to mark. “One of the centre-backs decided to mark space and the centre-forward has got a really good header in. 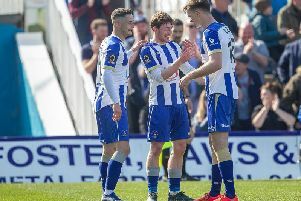 The Pools defence claimed the ball had not crossed the line but Moore said: “I couldn’t tell from where I was, but the players reckoned it wasn’t [over]. “But the linesman isn’t going to give the goal if he doesn’t think it’s over the line. The flag was up straight away. “We should never have been in that position. Moore felt Pools missed centre-half Matthew Bates who was ruled out with injury. “For 35-40 minutes we played with a tempo, we were at them but if you don’t defend crosses you won’t win games,” said the manager. “That’s what we have to cut out. “Yes we want a striker, but we missed Batesy and his steadying influence in there. Moore said some booing was no great shock although, overall, he felt it was a match Pools should have had something from. “I don’t think we were rubbish, Exeter go one up and the crowd boo at half-time,” he said.